You’re a student, too. You probably had the same worries as me as you were biking to school. Nothing. No ambulances, no cop cars. Not for a while. The remainder of my car ride to school was consumed by thoughts of you. The image of you lying on the street, broken and helpless, has not left my mind. A pool of blood was visible on the asphalt, even from inside my car. A woman was tending to you, a man waved cars away from the accident scene. Where were the paramedics? Why was there so much blood? Are you going to be okay? Why did this happen? Screw the math test. Screw the tardy. I immediately regretted not stopping to help you. Seconds turned into minutes. It wasn’t until I escaped the traffic and reached FVHS that the firetruck and ambulance finally drove out of the firehouse, sirens wailing, lights flashing. Those minutes felt like forever. The minutes I could’ve spent helping you until the EMTs arrived. I was haunted all day. Through first period, through second period, until now. The news spread. Students prayed for your survival, whether they knew you or not. Everyone was united in love and care for a fellow student. I was at a baseball game yesterday when I received a text message bearing news of your passing. I could not believe it, did not want to believe it. You’re only 15, your 16th birthday only a few days away. You’re still young, even younger than me. Why you? You had so much left to live for. Tonight was your candlelight vigil. I never thought I’d ever have to attend one for someone my own age. From two streets away, I could see a stream of yellow lights. Headlights, I thought, as it was nearing sunset. As I got closer, the lights got brighter. Candles. Bright yellow flames. Dozens and dozens of candles lit up the night sky. Lights from three police cars illuminated the area. Bouquets of flowers, bunches of balloons, handmade posters, FVHS wrestling shirts, even the Tech Decks you loved to play with were left in your memory. A large crowd of people stood in the cold evening air, remembering you. From parents to teachers to students to strangers, we gathered to remember a member of the Fountain Valley community. To the students, you were an FVHS wrestler, a fellow Baron, one of us. You walked the same halls and attended the same classes. You have touched all of us, whether we personally knew you or not. We got to know you through the many stories people shared. I wish I helped you, Sean. You’ll always be in my heart. We lost a classmate, but Heaven gained an angel. 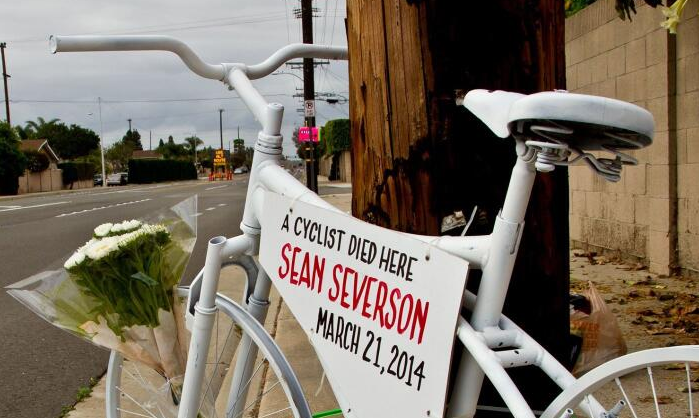 Rest In Paradise, Sean Dylan Severson. This entry was posted in High School, Life and tagged rip, sean severson. Bookmark the permalink. 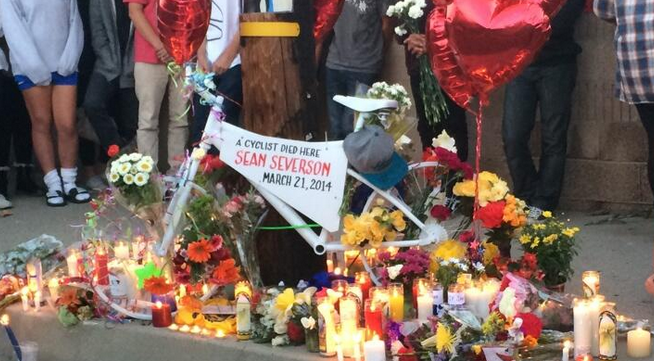 Sean was loved by many and he will continue to live on in our hearts. I’m sorry for your loss. My prayers go out to you and your family.